Related links to "Ultha - Converging Sins 2xLP"
ULTHA's second full-length album 'CONVERGING SINS' is a 63 minute rumination on the subject matter of how past events and wrong decisions will echo throughout the rest of our mortal existance.Over years experiences of failure and the conscious ability to willingly commit mistakes, to hurt, to reject,to alternate truths etc. lead to a path where silence in and around you is the ultimate repercussion. Therecord is a testimony to everyday melancholia, inner solitude and the human struggle to lead the wrong life in the right, the struggle against your animalistic nature. 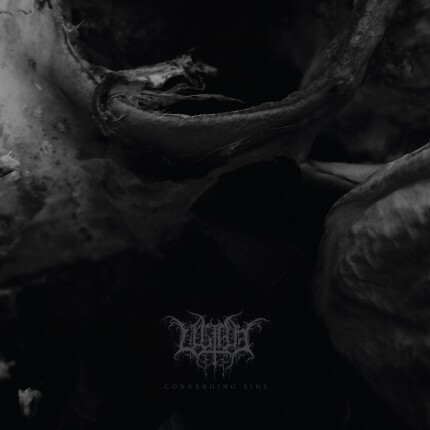 On their second album ULTHA further their trademark sound of fast, hypnotic, reverberant Black Metal in a more US traditon played by acts such as Ash Borer, Weakling, Leviathan and Wolves In The ThroneRoom. It is combined with crushing Doom heaviness close to acts such as Lycus, Asunder and Forn while also blending in an overall hopeless and gloomy atmosphere mostly connected to Dark Wave bands suchas The Sisters Of Mercy and (early) The Cure. The 2016 EP 'DISMAL RUINS' already showed the path ULTHA follow, adding multiple layers of electronics and slower passages in focus on overall diversive,captivating songstructures in mix with their juggernaut sound. The five songs reach lengths up to almost 20minutes while still balancing repetition and settle nuances in riffs to manifest melodies like echoes in the listeners head. And this is a thing ULTHA were good at right from the start: Writing real songs with tons of melody without lacking heaviness and urging intensity. The focus is always on the overall flow and feel of the record. Therefore the music, the metaphorical, cryptic lyrics by main songwriter R.Schmidt as well as the artwork (envisioned by Kevin Gan Yuen of SutekhHexen fame) need to be treated as a whole entity. The songs we're once again recorded and mixed in the bands rehearsal space called 'The Oil Pit' by thebands own Andy Rosczyk in Cologne (Germany). Mastering duties this time were taken by Jack Shirley at his Atomic Garden studio (California), where he already formed the massive sound of bands such as Lycus, Oathbreaker and Deafheaven. On track No.2 'Mirrors In A Black Room' the band could win British native currently residing in Berlin (Germany), Rachel Davies of the acclaimed post-punk/wave band Esben And The Witch for guest vocals. But she not only sang but also co-wrote the lyrics to the song.